Did you know you can now order your Deliveroo takeaway from The Good Earth here on View? The Good Earth offers innovative Chinese cuisine served in chic and relaxed surroundings. Do you work at The Good Earth? What did you think of The Good Earth? Won't be eating here anytime soon! We had a takeaway from the Ridgway branch in Wimbledon and the food was rather disappointing. The Pad That was bland and tasteless, my husband ordered the sweet and sour pork and the pineapple pieces were terrible (going off) which he didn't eat. For what we paid yesterday the food was not worth it at all. 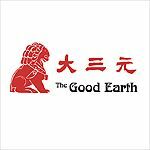 The Good Earth chain comprises four restaurants and four takeaways across London and Surrey and delivers high quality, wonderful Chinese food in a very smart setting. The newly-opened branch overlooking Wandsworth Common and a stone’s throw from the renowned Chez Bruce is in a prime location to catch the drive-by eye, and to draw in the local affluent crowd. With its trademark red and gold signage and imposing air of class, you can’t miss it, and nor should you. The seating area on entrance is sophisticated featuring lime green leather sofas and there is certainly a mirror theme going on. The pillars and many of the walls are mirrored giving the illusion of an even bigger restaurant than it already is. The dark veneered wood, leather dining chairs and padded-leather mustard wall panelling create a very contemporary and stylish atmosphere. The lighting, however, could be a bit dimmer just to drive that welcoming ambience home. And you know they must be impressive when they’re worth a hat-tip, but the swanky toilets with automatic sliding door are a smooth touch. To start, the chicken and chive dumplings (£8.40) are noticeably handmade, and are delicate, perfect little mouthfuls to whet your appetite. The dry Chiu Yim ribs (£8.80) are loaded with the three savoury treasures, garlic, chilli and spring onion, and the Dragon’s Whisker prawns (£8.40) are something of a visual delight – two elongated King prawns wrapped within an inch of their lives in vermicelli noodles and deep fried until they are crisp. Aromatic duck, pancakes and the usual suspects (£13 for a quarter) are good; the duck skin meltingly naughty. For those few brave with an asbestos tongue, the Shanghai chicken (£13.80) is superb, rich, smoky and adorned with bird's eye chillies. The XO beef (£14.80) with their homemade XO sauce is made all the more unctuous by the use of rib-eye steak with sugar snaps thrown in at the last minute; it's a simple yet divine dish. Similarly, the fillet steak clay pot (£16.80) cooked at the table is far from complex. Some onion, garlic, peppers and great quality steak tossed in soy (and no doubt oyster sauce), it provides a nice little spectacle not to mention a mouth-watering aroma. Several dishes on the menu derive from the fragrant and spice-heavy cuisine from the province of Sichuan. The Sichaun prawns are plump, fresh and coated in a tangy hot sauce but at £17.80, the six solo prawns don't come cheap. The pièce de résistance, though, and a wonderful thing to share with your dining partner, is the steamed whole sea bass (£24.80) which is ozone-fresh, steamed to delicate perfection with fragrant spring onions and ginger and then doused with hot oil and soy (and masterly deboned on request). Steamed rice is all that’s needed with such an array of dishes but it would be a shame to miss the classic Sichuan dish of fried green beans with dry shrimps (£8.80) which is blistered with salty goodness. The Yu-Shang aubergines (£8.80), again a typical Sichuan home-style dish, are swathed in a spicy garlic sauce but sadly lack some seasoning (steep with soy to amend). Despite this, overall the food is pretty flawless. The Marlborough Isabel Sauvignon Blanc (£33) is a great, mature wine and effortlessly stands up to the food with a fully stocked bar for all the favourites. This is not your averagely priced Chinese restaurant but if you can afford to pay that bit extra for something a little special, then do it.